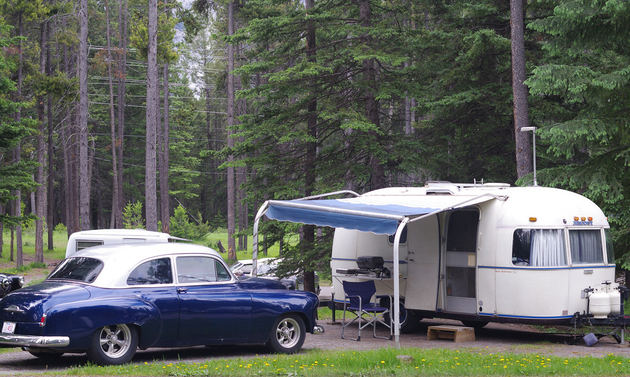 If you need an excuse to go camping, rolling your hot rod to Banff’s Tunnel Mountain campground is as good as any. 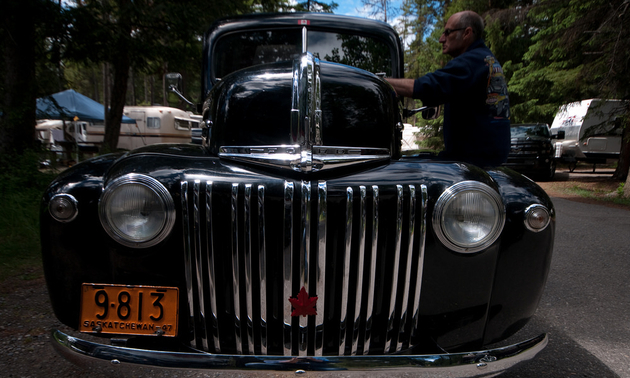 For 48 years running, members of the Touring Tin Car Club have been meeting in Banff, Alberta, to show off their rod iron, generate charity, connect with old friends and swap stories—and maybe car parts. 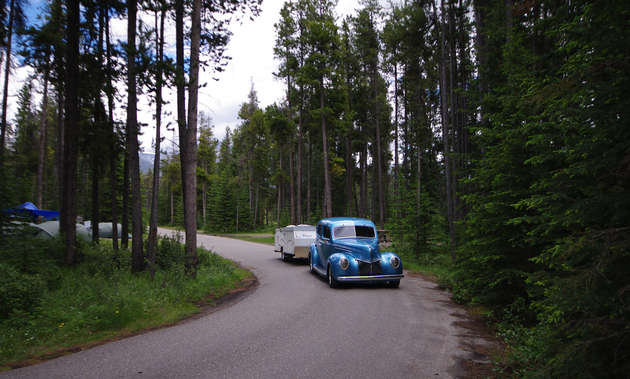 If you need an excuse to go camping, rolling your hot rod to Banff’s Tunnel Mountain campground is as good an excuse as any. A story vortex happens whenever two or three hot-rodders gather around a raised polished hood: approach and you will soon be swirling in stories. Here are some of them. “You can’t go out with him, he drives a hearse,” said a certain young woman's grandmother. No matter, the granddaughter in question is still married to Ralph Blackwell from Saskatoon, Saskatchewan. And he still drives the 1947 Ford panel. (It’s not a hearse, but it could pass for Al Capone’s staff car.) Usually they travel with their Boler trailer in tow. The Blackwells' decal was designed for the 100-year anniversary of the Blackwell family in Canada. Now Ralph is working on a 1937 Ford Cabriolet he has had since he was 16 years old. 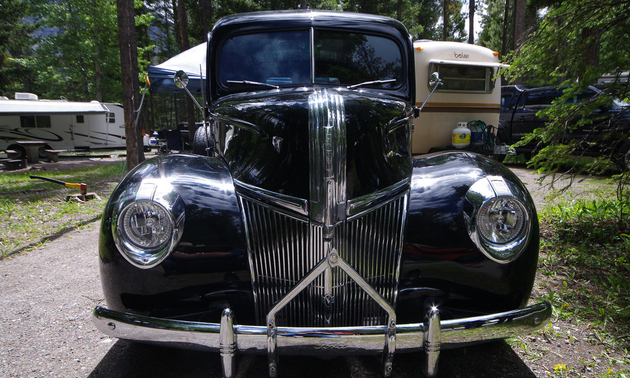 Burt Beckman from Edmonton, Alberta, came to the first Banff rod run 48 years ago in his '32 Ford. He’s been at every one since. This year he brought his vermilion-red '46 Ford two-door sedan, powered by a 1969 Buick 455-cubic inch V-8. The ’46 has lots of power to pull his vintage fibreglass Casita trailer. Beckman is one of the original rabble-rousers in a varied collection of engaging characters. 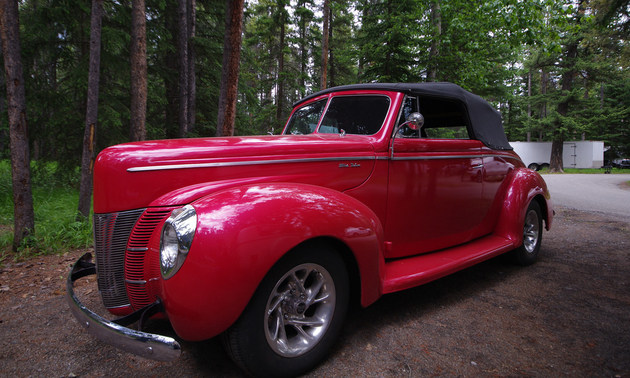 Thomas Hughes from Ponoka, Alberta, arrived in his motorhome, his 1940 Ford Deluxe convertible in a covered trailer. The ultra-red print paint seems to change colour in the bright sunshine because there is 400 grams of pearl in every gallon of paint. 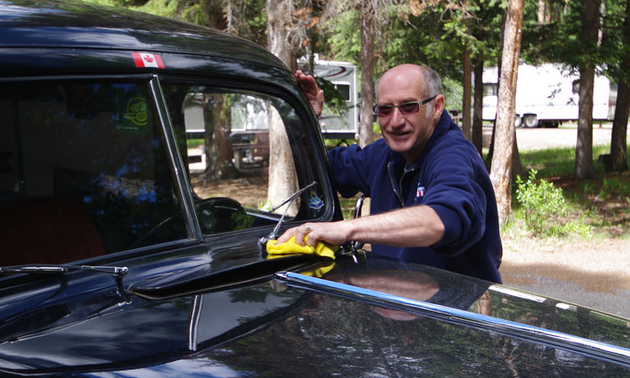 Hughes traveled 149,000 kilometres with his car and colour-matched Boler. The Deluxe is powered by a 427-cubic inch Corvette engine and has a Corvette rear end. Now he pulls the car trailered behind the '99 Monaco motorhome—maybe because the car is appraised at $85,000. 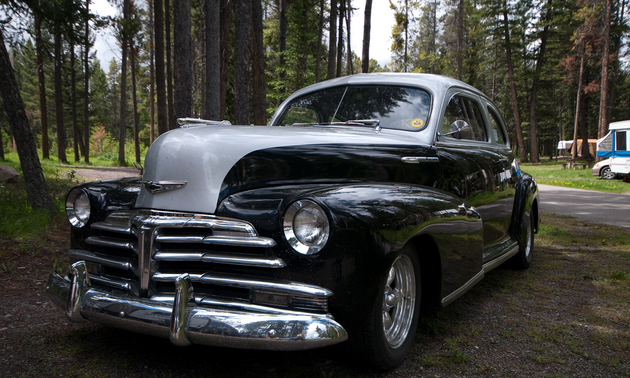 Gene Spitzer’s 1948 Chevrolet Stylemaster is two-tone black and silver, and it is for sale. He needs to free up room in the garage for his next project, a 1940 Ford coupe. Spitzer said that every year the club makes sure the money it generates goes to the highest need. Sometimes it is childcare for women re-entering the workforce, but it’s always co-ordinated with folks from the town of Banff. 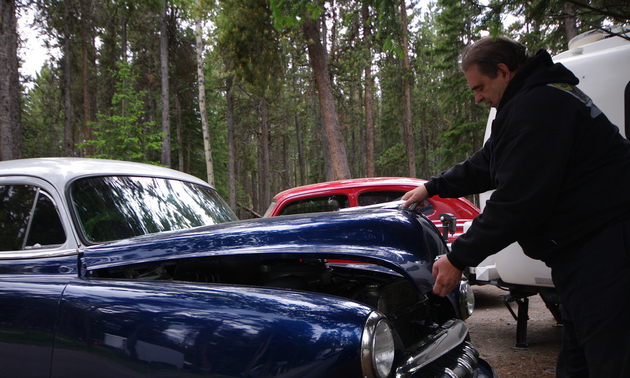 Bob Hielmeier drives a '52 Chevrolet 150 two-door sedan. This is the car he purchased when his '53 Pontiac was totalled—hit from behind at a red light. That was his grandfather’s car. 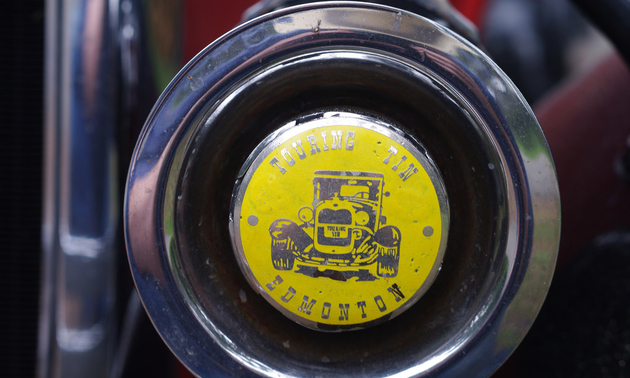 He bought the Chevy at the Red Deer Nationals 12 years ago and runs a fuel-injected 350 V-8 paired with a 700 R-4 transmission. He pulls a 1979 Argosy Minuet trailer. It was the year that the United States was planning on going metric. In spite of the U.S. failure to execute the transition to metric, that year’s model was named Six Metre. In 2000 Hielmeier took the '53 Pontiac and Argosy all the way to the east coast, travelling 20,000 kilometres over 49 days. 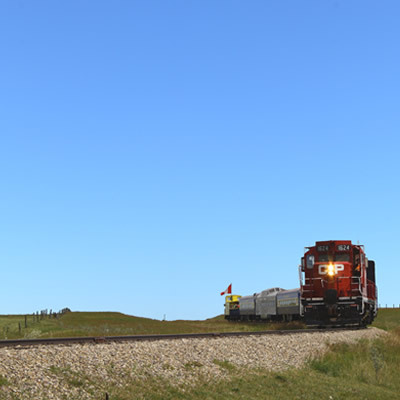 He never stopped anywhere more than two nights, averaging nearly 500 kilometres on travel days. 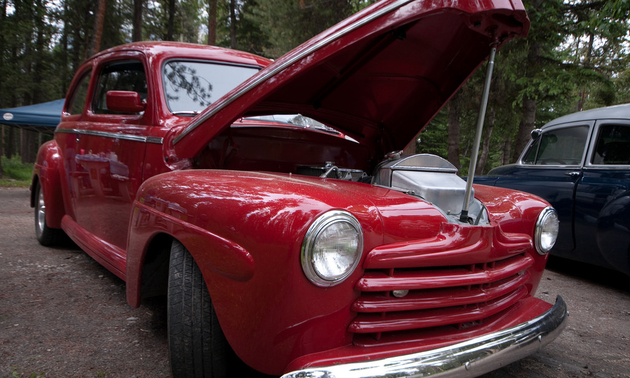 Darryl Tricker’s 1941 Ford half-ton panel was found sitting in a gravel pit and purchased for $15. It has been in his family since 1976. At 14 years old he launched his first rod project. He still has that one. Tricker is proud of his 351 Windsor Ford motor, and maintains Ford vehicles should have Ford motors (in spite of some Touring Tin members putting Buick, Chev or even Corvette engines in their Fords). The Ford rumble of the 351 seems to fit. Another couple, Mo and Robin, have taken a break from Travelling Tin club membership because of pressing family matters but still hit some events to connect with old friends. 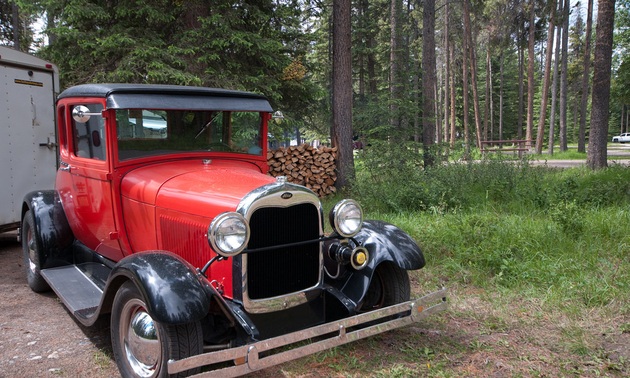 They have owned their 1929 Ford Coupe Special Model A for 27 years. Before they had the motorhome and covered car trailer, they camped with a colour-matched '73 Boler. This year they plan to hit four Traveling Tin events. 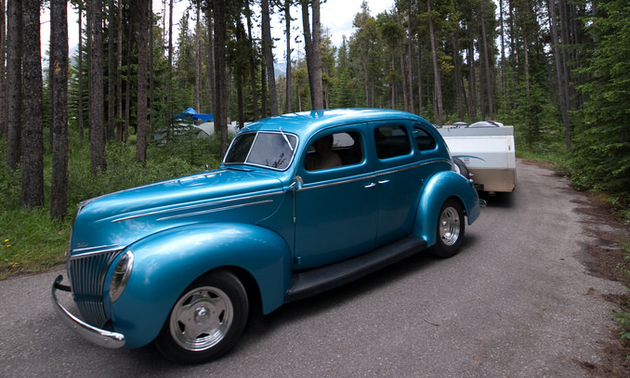 Roger Lee from Saskatoon arrived with his family and pop-up A-frame trailer in a 1939 Ford four-door deluxe sedan. The unique turquoise blue of this car happens to be a 1986 Mazda special edition colour. The cool thing about hot rods is you can paint them any colour you want. Lee joined the club 25 years ago and has made most of the events. It seems the pleasure of hot rod ownership comes in three parts—finding a worthy project, wrestling the dream to life and driving it. There is no rumble like the rumble of a carbureted V-8 with dual exhaust. And there are no friends quite like old rabble-rousers caught in the vortex of stories.